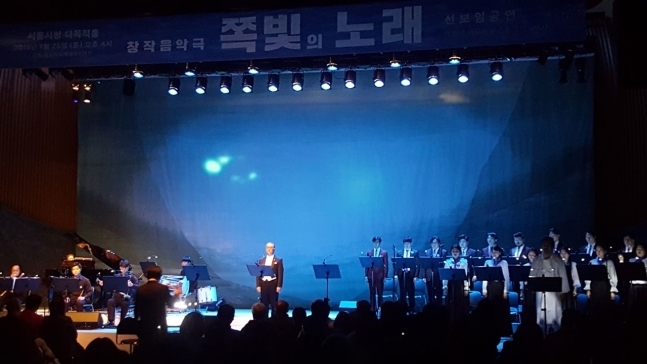 A musical performance created in remembrance of the Sewol ferry tragedy was showcased to the public over the weekend. On Saturday, a preview event for “Song of Jjokbit” -- jjokbit translates to indigo blue -- was held at the Seoul City Hall. The performance centers on the tragic accident in 2014, when the Sewol ferry capsized near waters off Jeju Island, resulting in the death of more than 300 people, mostly high-school students on a field trip. “We all tried to change despair from (the Sewol ferry tragedy) into hope at one’s own place. Today, we hope to share a part of the effort, the efforts of artists,” said Lee Su-ho from the Jeon Tae-il Foundation, one of the organizers of the performance. The performance, which took 1 1/2 years to prepare, consists of four songs and two poems, metaphorically depicting the bereaved families of the accident and criticizing the irresponsibility of the authorities. Around 200 people attended the showcase, with yellow ribbons attached to their clothing or belongings in commemoration of the victims of the disaster. The performance will be held at the headquarters of the KBS broadcasting station in Seoul on May 24 and 25 before going on tour across Suwon, Daegu, Gwangju and Jeju Island.